I love portrait photography, it's such fun meeting lots of lovely families and working together to get relaxed and fun memories to treasure for years to come. I have two young boys myself and over 7 years experience photographing children so I like to think I'm pretty good at working on the children's level to first build a relationship and make the session as fun as possible. I'm very happy to tailor your session, you might wish to invite grandparents or extended family, I'm also are very happy to work with pets - I cover all ages, from newborn to the grown ups! I've worked with lots of families with children who have additional needs, if your child does have additional needs simply mention this on booking, we'll have a chat to understand their needs and what would work best for them. I offer both studio and natural light photography and I offer Full Family sessions which give 15 High Resolution images right down to Micro Sessions (with 2 digital images) ensuring there is something for all budgets - visit my Pricing page to see which package is right for you. All packages include digital images with full copyright to share and print as you wish - I really want you to make the most of your shoot results! 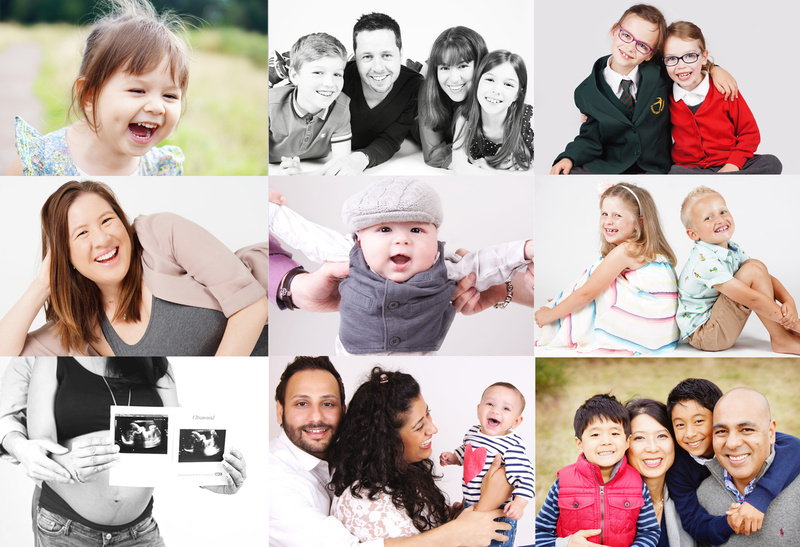 Here are some of the session types I regularly photograph, family sessions, cake smash shoots, professional headshots for adults and juniors, school re-take sessions, nursery and school photography, weddings and special occasion photography. My studio sessions run on specific dates at my relaxed and comfortable home studio in Bisley, Woking. Please visit the calendar to see my studio dates and the contact page for full address information. Your natural light session can take place within your own home/garden, at a location of your choice or at our base at the beautiful Wetlands Centre in Horsell, Surrey. Natural light sessions are available mid week and at weekends, please contact me to check availability. Please note a travel surcharge may apply for locations farther than 7 miles from Woking. Please take a look at my Portrait Gallery and check out my Facebook reviews page to see what my clients say about their experience.. If you'd like to book or would like more information please contact me.